Writing the final pages of his masterpiece The Origin of Species, Charles Darwin looked ahead to the work yet to be done on his groundbreaking theory of evolution by natural selection. "In the distant future," he predicted, "I see open fields for far more important researches. The power to manipulate genetic material. And this is just a sample of the deep insights and remarkable conclusions that Darwin's ideas inspired. 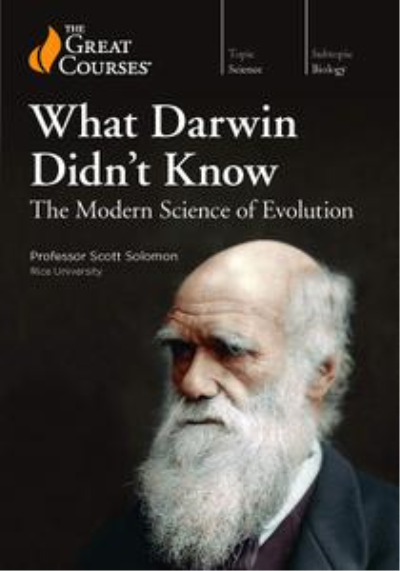 What Darwin Didn't Know: The Modern Science of Evolution charts this scientific revolution in 24 stimulating half-hour lectures suitable for curious learners at all levels, no matter what your background in science. Darwin is renowned for his globe-circling voyage on the HMS Beagle when he was a young man, collecting observations that eventually led to the theory of natural selection. The outstanding teacher of What Darwin Didn't Know is no less a world traveler. Professor Scott Solomon of Rice University has explored much of Earth's amazing biodiversity as a field biologist, and he brings hands-on experience to these fascinating lectures, which cover 160 years of non-stop scientific advances.